As a cleaning contractor, you probably have to work hard in order to survive and prosper in today’s economic environment. You may also have to worry increasingly about the risks and financial exposures that arise not only as a result of potential misfortunes such as theft of equipment but also from your various liabilities. At Marsh Down Insurance Brokers, we have insurance options specifically designed to protect the interests of cleaning contractors. offices, shops, pubs and other premises covered. * Cover may vary depending upon your requirements and the precise nature of your cleaning business. This is, of course, only a very brief sample of the total protection available. By definition, cleaning services typically involve you or your employees working on customers’ premises and often with their possessions, property, equipment and facilities. That implies significant risk in many areas including, of course, through your liabilities to your own employees. Today, both your customers are your employees may be very quick to hold you accountable should things go wrong and that might involve you in very significant expense – perhaps to the extent of putting your entire business at risk. 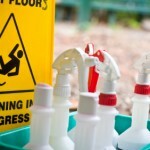 Cleaning contractors insurance exists to help protect you from the financial consequences of such problems. It might be worth giving serious consideration to the excellent cover provided by our product. We are very experienced in working with a range of small businesses, including cleaning contractors, to find suitable cover. We also recognise the financial pressures of the current financial environment and that’s why we also place such a high degree of emphasis on cost-effective solutions.